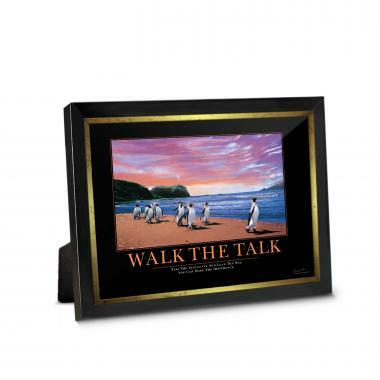 Walk the Talk Penguins framed desktop print image: With a breathtaking sunset at their backs, a group of penguins, dressed for success, follow their confident leader along the shoreline. Jump-start each day with a 5"x7" Walk the Talk Penguins framed desktop print in every work area. This easel-backed framed desktop print has a matching motivational poster.